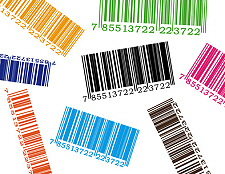 Finding the most efficient colours for a linear barcode may seem a daunting task. The contrast between the colours needs to be spot on in order for barcode labels to be working at optimum performance. However it is not as difficult as at first it may seem. The most fundamental concern is to reproduce the exact colour swatch. Frightening. So lets explain that a little bit further by taking away the jargon. The Rmin is always the color for the bars; the Rmax is always the background color. The threshold is 40% to achieve an ANSI/ISO C grade, but if you’re printing a barcode on corrugated, the threshold is 20% for an ANSI/ISO D.
A Barcode label verifier can give you the readings in very easily as they can be used as “reflectance densitometers” and can collect Rmin and Rmax values automatically—and some will even do the SC calculation for you. The verifier will produce a percentage which will either be too high or too low for a good contrast. 70% is considered acceptable for a good result. It should also be taken into account that the result maybe very marginal but positive. In these cases it is advised to consider different colours in order to attain a higher contrast. You will need the barcode label to be working at optimum performance rather than just good enough. Also it needs to be taken into account (as stated at the beginning of the article. At Tanto labels we have come to understand that by simplifying and clarifying the choice available and helping the client customise products to their own work environment it leads to a very fruitful working relationship. We offer support for barcode labels to all of our clients from beginning to end. Please do not hesitate to call us on 01934 417665 .